The majority of Americans live in suburbs and until about a decade or so ago, most suburbs had been assumed to be non-Hispanic White, affluent, and without problems. However, recent data have shown that there are changing trends among U.S. suburbs. This book provides timely analyses of current suburban issues by utilizing recently published data from the 2010 Census and American Community Survey to address key themes including suburban poverty; racial and ethnic change and suburban decline; suburban foreclosures; and suburban policy. "[T]his book will be a useful addition to the shelf of any scholars interested in the changing socio-economic and cultural patterns of US suburbia. Many of the individual chapters could find their way into the reading packs for US urban studies courses. 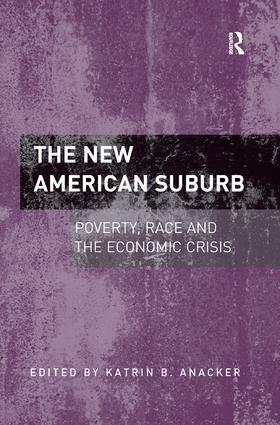 The suburbs of the US are increasingly socio-economically and ethno-culturally diverse and this book provides helpful testament to their ongoing fissures and ruptures." Contents: Introduction, Katrin B. Anacker. Section I Suburban Poverty: The resurgence of concentrated poverty in America: metropolitan trends in the 2000s, Elizabeth Kneebone and Carey Anne Nadeau; Debunking the 'cookie-cutter' myth for suburban places and suburban poverty: analyzing their variety and recent trends, Karen Beck Pooley. Section II Racial, Ethnic, and Nativist Change: The Washington, DC Metropolitan Region - traditional no more?, Carolyn Gallaher; Local immigration legislation in two suburbs: an examination of immigration policies in Farmers Branch, Texas, and Carpentersville, Illinois, Bernadette Hanlon and Thomas J. Vicino. Section III Suburban Decline - Or Not? : Beyond sprawl: social sustainability and reinvestment in the Baltimore suburbs, Bernadette Hanlon; Metropolitan growth patterns and inner-ring suburban decline: a longitudinal analysis of the 100 largest U.S. metropolitan areas, Sugie Lee, Nancey Green Leigh and Andrew McMillan. Section IV Suburban Foreclosures: Responses to foreclosure and abandonment in Cleveland's inner suburbs: three case studies, W. Dennis Keating; Punctuated equilibrium: community responses to neoliberalism in three suburban communities in Baltimore County, Maryland, Gregory Smithsimon. Section V Suburban Policy: Revitalizing distressed older suburbs: case studies in Alabama, Michigan, Ohio, and Pennsylvania, Kathryn W. Hexter, Edward W. (Ned) Hill, Benjamin Y. Clark, Brian A. Mikelbank and Charles Post; The response of the nonprofit safety net to rising suburban poverty, Benjamin J. Roth and Scott W. Allard. Index. Katrin B. Anacker is Associate Professor at George Mason University's School of Policy, Government, and International Affairs, Arlington, VA, USA.